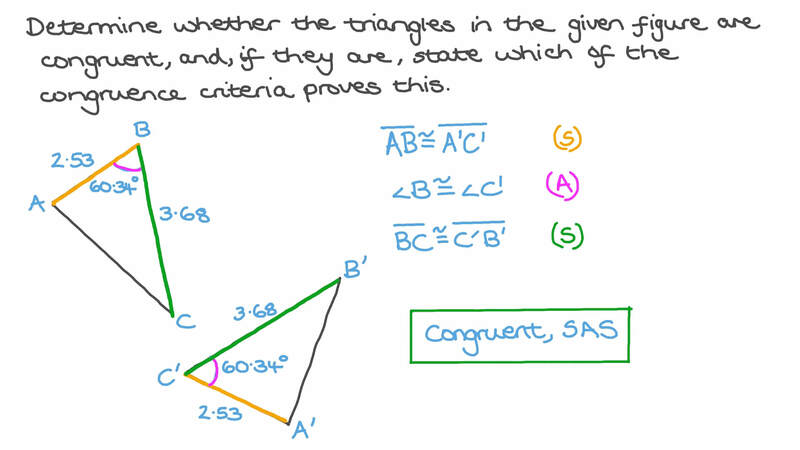 In this lesson, we will learn how to prove that two triangles are congruent using either the SSS or the SAS criterion. Determine whether the triangles in the given figure are congruent, and, if they are, state which of the congruence criteria proves this. Two triangles share two sides and a contained angle. Would the two triangles be congruent? 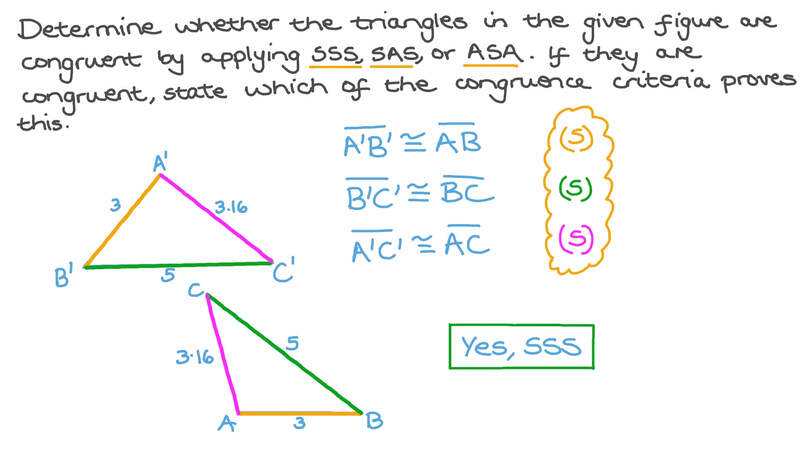 Determine whether the triangles in the given figure are congruent by applying SSS, SAS, or ASA. If they are congruent, state which of the congruence criteria proves this. Can you use 𝑆 𝐴 𝑆 to prove the triangles in the given figure are congruent? Please state your reason. Which congruence criteria can be used to prove that the two triangles in the given figure are congruent? In the given quadrilateral, 𝐴 𝐹 and 𝐵 𝐹 have the same length and 𝐸 𝐹 and 𝐶 𝐹 have the same length. Which angle has the same measure as ∠ 𝐴 𝐹 𝐸 ? Hence, are the triangles 𝐴 𝐹 𝐸 and 𝐵 𝐹 𝐶 congruent? If yes, state which congruence criteria proves this. 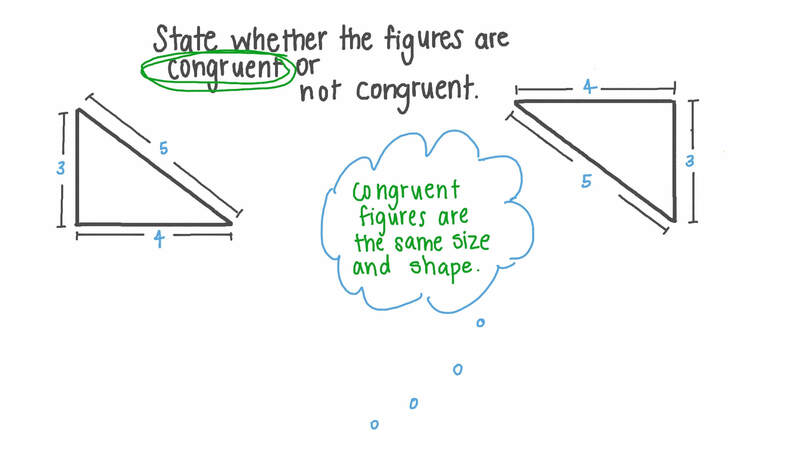 State whether the figures are congruent or not congruent. Which of the following statements will be true for two triangles that are congruent? AThere will always exist a combination of translations, reflections, and rotations that could be used to map one triangle onto the other. BThere will be only rotation that could be used to map one triangle onto the other. CThere will always exist a combination of translations, reflections, rotations, and dilations that could be used to map one triangle onto the other. DThere will be only reflection that could be used to map one triangle onto the other. EThere will be only translation that could be used to map one triangle onto the other. In the given figure, triangle 𝐴 𝐵 𝐶 and triangle 𝐵 𝐶 𝐷 have two equal sides and share one equal angle. Are triangles 𝐴 𝐵 𝐶 and 𝐵 𝐶 𝐷 congruent? Given that 𝐸 is the midpoint of 𝐴 𝐶 in the given figure, without referencing angles, which congruence criteria could you use to prove triangles 𝐴 𝐵 𝐸 and 𝐶 𝐵 𝐸 are congruent? ATriangle 𝐴 𝐵 𝐶 can be rotated onto triangle 𝐷 𝐸 𝐹 and, thus, the triangles are congruent. CTriangle 𝐴 𝐵 𝐶 can be reflected onto triangle 𝐷 𝐸 𝐹 and, thus, the triangles are congruent. DTriangle 𝐴 𝐵 𝐶 can be translated onto triangle 𝐷 𝐸 𝐹 and, thus, the triangles are congruent. ATriangle 𝐴 𝐵 𝐶 can be reflected onto triangle 𝐷 𝐸 𝐹 and, thus, the triangles are congruent. CTriangle 𝐴 𝐵 𝐶 can be rotated onto triangle 𝐷 𝐸 𝐹 and, thus, the triangles are congruent. From the following figure, what can we conclude about a possible Side-Side-Angle (SSA) congruence criterion? A SSA is not a valid congruence criterion. B SSA is a valid congruence criterion. C There is nothing we can conclude. D SSA is a criterion that works sometimes. ATriangle 𝐴 𝐵 𝐶 can be translated onto triangle 𝐷 𝐸 𝐹 and, thus, the triangles are congruent. BTriangle 𝐴 𝐵 𝐶 can be rotated onto triangle 𝐷 𝐸 𝐹 and, thus, the triangles are congruent. DNo sequence of translations, reflections, or rotations exists that can map triangle 𝐴 𝐵 𝐶 onto triangle 𝐷 𝐸 𝐹 and, therefore, the two triangles cannot be congruent. ANo sequence of translations, reflections, or rotations exists that can map triangle 𝐴 𝐵 𝐶 onto triangle 𝐹 𝐸 𝐷 and, therefore, the two triangles cannot be congruent. BWe can apply a two-stage transformation on triangle 𝐴 𝐵 𝐶 involving a reflection and then a translation to obtain triangle 𝐹 𝐸 𝐷 and, thus, the triangles are congruent. CTriangle 𝐴 𝐵 𝐶 can be rotated to obtain triangle 𝐹 𝐸 𝐷 and, thus, the triangles are congruent. DWe can apply a two-stage transformation on triangle 𝐴 𝐵 𝐶 involving a translation and then a rotation to obtain triangle 𝐹 𝐸 𝐷 and, thus, the triangles are congruent. The two triangles in the given figure have two sides and a contained angle that are equal. Triangle 𝐴 𝐵 𝐶 could be mapped to triangle 𝐷 𝐸 𝐹 by a reflection in the line ⃖      ⃗ 𝐺 𝐻 . Are the two triangles congruent?